Penn High’s Kingsmen rallied from a 13-point deficit in the fourth quarter to close to five points, but Merrillville held on for a 70-64 victory in the regular-season finale on Friday, Feb. 23. 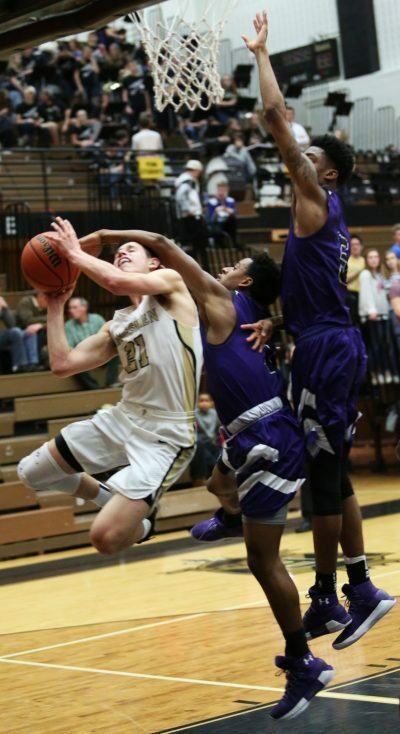 Noah Applegate scored 22 points to lead the Kingsmen. Drew Lutz scored 21 points and kicked out nine assists. Penn’s lone senior, Noah Krathwohl, scored nine points on Senior Night. Kegan Hoskins and Beau Ludwick scored six points each for Penn. The Kingsmen open state tournament action at the Class 4-A Mishawaka Sectional on Tuesday, Feb. 27, against the host Cavemen. Tip-off is slated for 6:30 p.m.
PENN 64: Carter Hickey 0, Drew Lutz 21, Beau Ludwick 6, Luke Carlton 0, Noah Applegate 22, Noah Krathwohl 9, Kegan Hoskins 6, Jeffrey Hemmelgarn 0, Christian Marshall 0. Merrillville 70: Keon Thompson 2, Cameron Wright 2, Braedan Stubbs 11, Jayon Holmes 13, Will Fulton 2, Rob Sanders 12, Darryon Bandy 28, Lavari Ruffin 0. Three-pointers: PENN 6 (Drew Lutz 2, Beau Ludwick 2, Noah Applegate 2), Merrillville 5 (Sanders 3, Bandy 2).